Direct GULF front!!! Building and unit have been completely renovated. Condo is located in a small, low rise, three story high building with 47 units next to the state park. YOU WILL NEVER SEE CROWDS AT THE BEACH. This is not a big resort but a perfect place to relax. Complex has a swimming pool and a jacuzzi. Convienient location close to restaurants, shopping, golf and theme parks (across the street from THE TRACK amusement park). 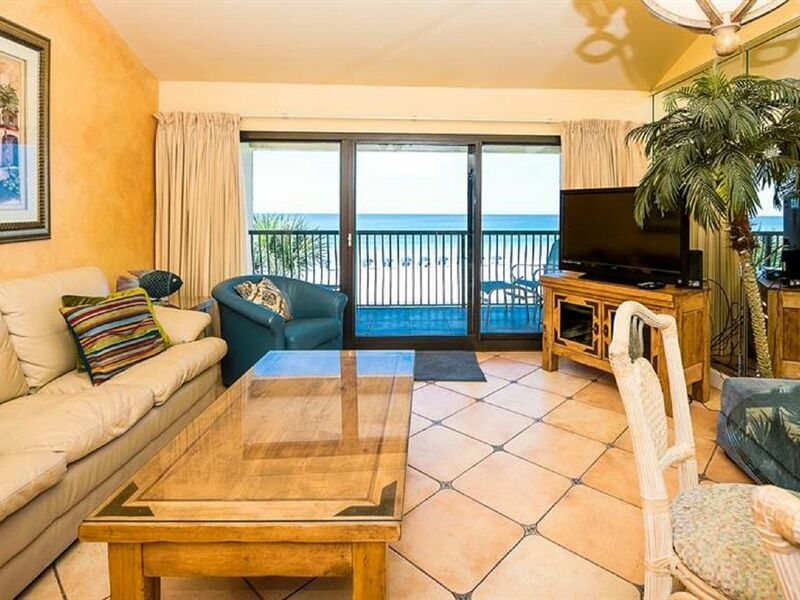 Condo is located on 3rd story (high vaulted ceilings) - with is a fantastic view of emerald, crystal clear water of the Gulf and white powder sand. Sit on a balcony and see dolpins swimming at a short distance and gorgeus sunsets in the evening. You are so close to the water edge, that you feel like you are almost floating on water. Unit has a good size, fully equipped kitchen with granite countertops, 2 bathrooms (one with a huge walk-in shower (much larger than the picture shows) and the other one has a whirpool tub). HDTV in a living room, high speed internet. Bedroom has a comfortable king size bed, sleeper sofa in a living room and 2 bunk beds. This condo has a brand new, fresh feeling, decorated with beautiful terracotta porcelain flooring tile and hand painted inserts, warm colors throughout, new furniture. Free daily beach service available spring to fall.- . Do not miss this unit. This is absolutely the best one you can find. I currently live in Sarasota, Florida and manage few of my vacation rental properties myself. I absolutely love Destin and its pristine beaches and crystal clear water all year round. Sarasota is know for Best Beaches in US, but there is no comparison. I frequently come to Destin to relax and enjoy the uncrowded, white sand beaches, the best shopping and restaurants. Destin Beach Club is a very well maintained complex with very an extremely friendly staff. Our renters come back and feel here very much at home. This is the best place to relax and have fun. Master Bath has a juacuzzi tub Guest Bathroom has a huge walk -in shower. Membership to a local fitness Club is included. The condo was perfect for our family! The view of the beach was remarkable. If you bring tons of luggage you may have a problem (like my teenager did) because the bunks for our two kiddos didn’t offer anywhere to store their luggage but that wasn’t a big deal for us. It is amazing at this condo! The location on the beach and closeness to walking to restaurants matched our way of vacationing. We loved every minute of it and would highly recommend this condo! Very nice small condo with great gulf front views. The property was lovely with an old Florida vibe. We loved the hot tub area and the pool was beautiful. Thank you Jennifer for a 5 star review. It is greatly appreciated. We have stayed at this resort before. This unit was very well stocked with kitchen utensils! Large shower and comfortable bed. Would definitely stay in same unit again. The view and location are great. The unit is in good shape and the kitchen amply equipped for those who wish to cook and dine in. The only issue we had is where to hang wet beach towels and swimwear. Overall, a wonderful relaxing honeymoon. Thank you very much for posting your review. Congratulations on your wedding as well. We are happy you appreciated the view and location. There is a drying rack attached to the wall on the balcony where you can dry the beach towels and bathing suites. Thank you for choosing our unit for such a special occasion. This condo is beautiful and the view is amazing. The owner kept me updated as hurricane Michael made landfall just east of us. The management team was so friendly and helpful. LOVE this place and hope to return,. Thank you so much for your patience and understanding during hurricane Michael. I am so happy everything worked out for you and you were able to continue your vacation without an interruption. I am not sure if you were able to enjoy the beautiful, crystal clear, emerald water view during your stay. I hope you will be able to come back. The condo was super cute, clean, and spacious. The front desk staff was very friendly. I would definitely stay here again. Great location too! Thank you Brittany. It makes me very Happy as an owner to hear good things. I appreciate it. Take a beautiful scenic ride along 30A from Destin to Panama City, visiting state parks on the way, stopping at Seaside and Rosemary Beach. SPRING AND SUMMER RATE INCLUDE DAILY BEACH SERVICE (1 umbrella + 2 beach chairs) or discount will be applied. Check in time is after 4 pm, check out before 10 am. Minimum age is 25 unless accompanied by someone over 25.